ATTENTION! AS FROM 1 SEPTEMBER 2016, IT IS MANDATORY TO DISPLAY THE INFORMATION BELOW, INCLUDING PICTOGRAMS, ON ALL ONLINE SALES PLATFORMS, WHERE JULIUS-K9® DOG HARNESSES ARE SOLD. THIS INFORMATION IS COMPLEMENTED WITH A VIDEO. DISPLAYING THE VIDEO IS MANDATORY AS WELL. ALL THIS MINIMIZES THE RISKS OF DAMAGES RESULTING FROM CHOOSING THE WRONG HARNESS SIZE OR FROM INCORRECT HARNESS ADJUSTMENT. To adjust the hook&loop chest strap developed by Julius-K9® in 1997, open it and loop it through the oval ring which is on the front side of the harness. Close it on the inner side so the hooks and loops are facing each other. 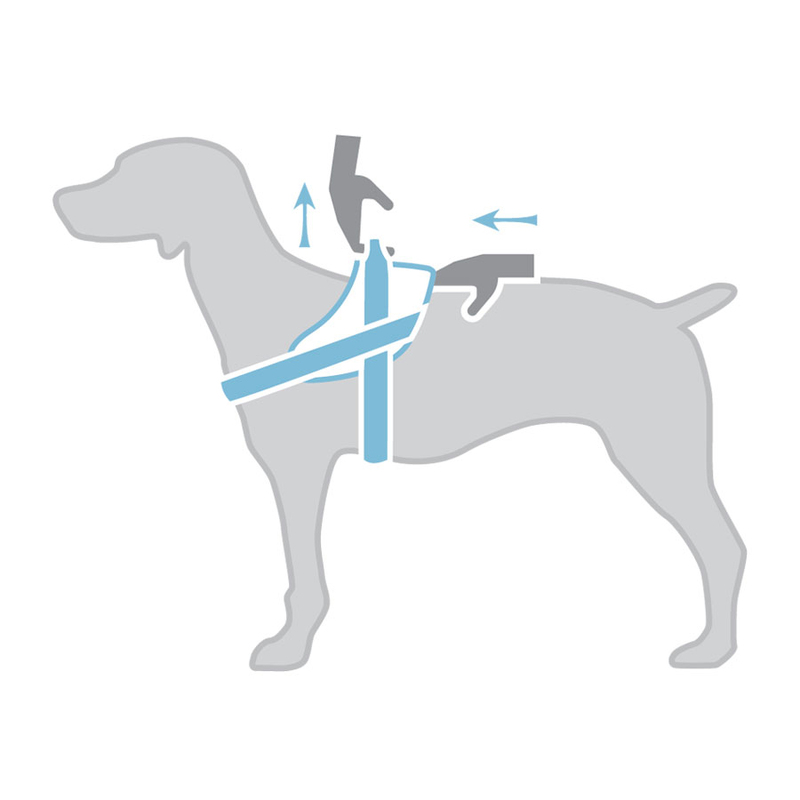 Set between the minimum and maximum length settings, the chest strap can support several times the dog’s weight. Taking thorough measurements of your dog is essential for choosing the correct harness size. Place 4 fingers behind the front legs to find where to measure the chest (girth) for harness sizes 0, 1, 2, 3 and 4, and 2 fingers to take measurements for sizes Baby1 and Baby2. The chest circumference should be measured where the strap is supposed to be located. Before putting on the harness, it is very important to adjust the chest strap and the lower strap under the chest correctly. If the straps are too loose, the dog might be able to back out of the harness. When the lower strap under the chest is too tight, it is ‘merely’ uncomfortable for the dog. When the chest strap is too tight, the buckle rubs against the dog’s skin in the armpit area, which can cause chafing. If the lower strap under the chest is adjusted correctly, there should be enough room for you to fit your fingers between the dog’s back and the harness. Warning! Choosing the wrong harness size, as well as incorrect harness adjustment and collar use may result in the dog slipping out of the harness or the collar. If the harness is too small, the chest strap puts pressure on the dog’s neck instead of distributing it over the chest area. Choosing the wrong harness size may result in injury. The handle part on the IDC® Powerharness has 4 different fastening options. It is possible to secure only the INOX® ring or only the handle, or both, or neither. Handles on IDC® harnesses (sizes Mini and Mini-Mini) and K9® harnesses can be secured/ covered up with hook & loop, thus minimizing the risk of the dog getting caught on something by the handle part. This is especially important for dogs running free. WHAT TO DO IF THE DOG BACKS OUT OF THE HARNESS? In case your dog attempts to slip out of the harness by backing out of it, or tries to pull its head out of the collar, avoid pulling the leash.